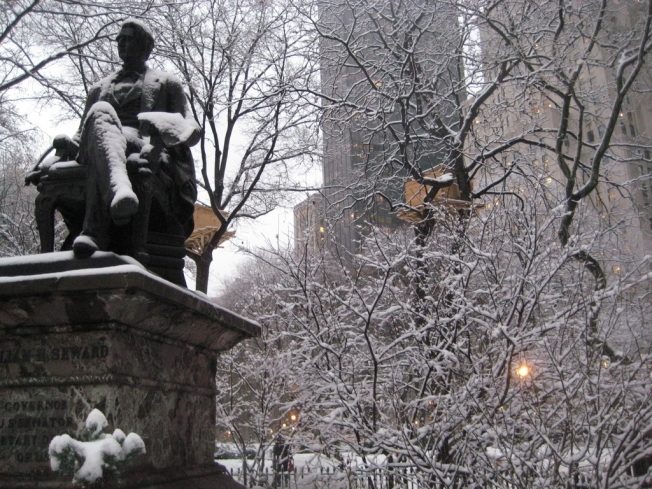 Snow fell on Manhattan Friday, leaving a white blanket on the statue of William Seward in Madison Square Park. A storm system that clobbered the Midwest moved into New York City on Friday, grounding more than 650 flights from the three major airports and giving schoolchildren an early start to the holiday break. Accumulations around the five boroughs and Long Island were forecast between 3 to 6 inches before the snow turned to rain Monday evening. In New Jersey and the northern suburbs, residents could expect between 6 and 12 inches of powder. Sleet and ice are in the forecast for Saturday. Temperatures in most of the five boroughs, Long Island and southern New Jersey are expected to hit the freezing mark overnight Friday, complicating commutes. While the snow has not hit the ground yet in our area, preparations for the storm are well underway. Travelers should expect slick roads and delays at the local airports. The city has more than 2,000 snow plows and 365 salt and sand trucks on standby as drivers get ready to work around the clock throughout the weekend. Some parts of New Jersey already have reported 4 inches of snow accumulations, and those northern areas could get up to 10 inches. Snowfall covered the ground in Sparta by mid-morning. News 4 New York's Pat Battle reported white-out conditions on the New Jersey Turnpike at 11 a.m. There was only a half-mile of visibility on the road and a 45 mph speed limit was in effect. A winter storm warning is in effect for Sussex, Warren, Morris, Hunterdon, Somerset, Passaic, Bergen and Essex counties. 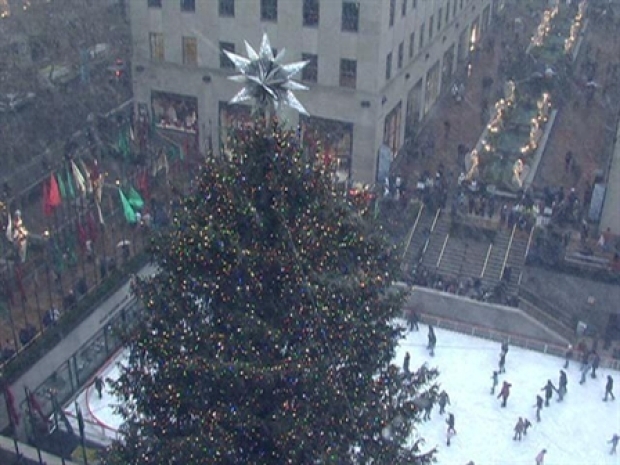 Watch raw video of snow swirling around the Rockefeller Christmas tree as the city braces for up to four inches of snow. More than 100 schools around the city either closed or planned an early dismissal before the snow even started falling. Click a link below for additional weather coverage. A winter weather advisory is in effect through Friday night for the Tri-State area, and there have been significant delays at area airports. American Airlines cancelled 28 of its 222 departing flights out of New York-area airports by mid-morning, including 17 flights from La Guardia, seven from JFK and four from Newark. The cancellations have been spread throughout the day and will continue through the late afternoon and early evening. American Airlines passengers, and people meeting arriving flights, should check AA.com for the status of their flights before going to the airport. Con Edison is closely monitoring the winter storm that is expected to bring several inches of snow, followed by sleet and rain. Con Edison is ready to mobilize extra crews throughout New York City and Westchester County the next several days to respond to any power outages. In addition, the company will be in close contact with the New York City Office of Emergency Management and the Westchester County Department of Emergency Services to coordinate storm-response activities if needed. 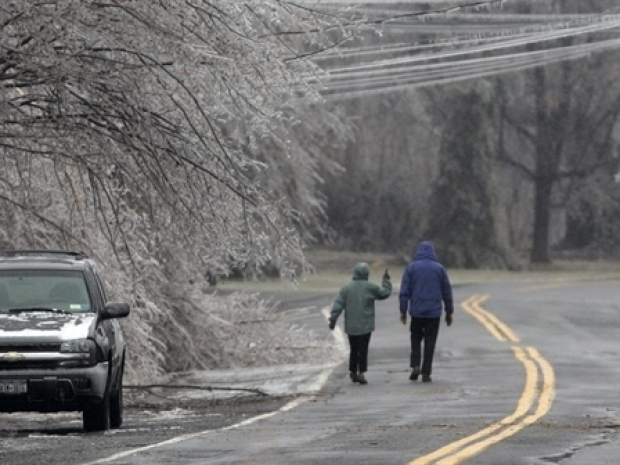 The company urges customers to report power interruptions or service problems online at www.conEd.com, or by calling Con Edison’s toll-free customer service number (1-800-752-6633). mediatrustpete: its dumping snow in new york city wOOt. benlim: My flight doesn't take off for 10 hours but it's already delayed 1 hour. Thank you snow (in both Seattle and New York). JustJon: Snow is really coming down in SoHo. Making me think of the Cub/They Might Be Giants song New York City. AppleDew: Snow storm in New York :) Christmas magic. elizabatu: Snow just starting with a vengeance here in upstate New York. School cancelled, boys asleep. eagle0Nine: The one weekend I leave New York... And we're getting five inches of snow. Thanks dudes. terroncito: new york is trying to catch up to seattle...the snow is falling. kensweet: so, all that snow @jmsummers was complaining about? It's now hit New York. We have horizontal snow - not sticking yet though.